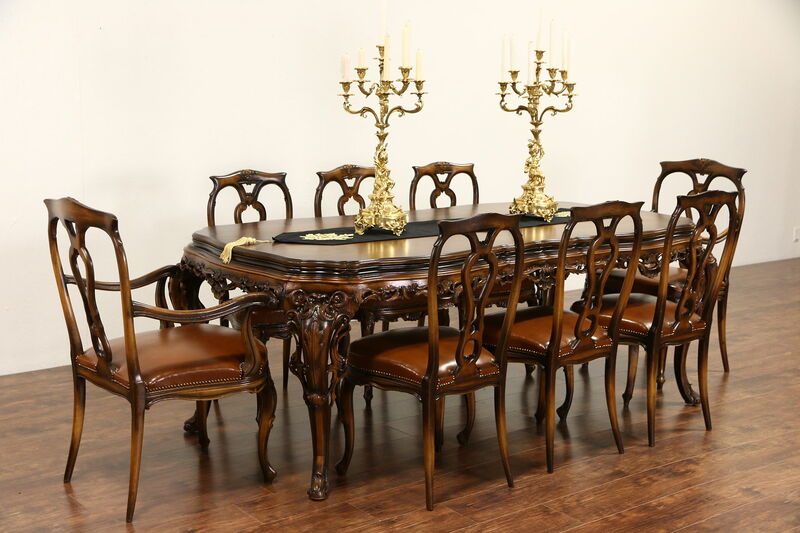 A spectacular dining set was carved in the Baroque manner in Italy in the 1930's and includes a table and eight chairs with leather seats. Richly sculpted of walnut and birch hardwoods, the renewed finish is subtly shaded and in excellent condition on this vintage furniture. Table size is 86" long, 45" wide, 31 1/2" tall and legroom is about 26." Chairs are strong and tight, reglued to serve another generation. There are slight warps to some of the chairs, see photos. Two arm chairs measure 25" wide, 24" deep, 40" tall and seats are 19" high, six side chairs are 20" wide, 22" deep and 39" tall.